Are we ever going to fix this pipe? Or is this like the FREE BEER TOMORROW sign painted on the wall behind the bar at a crummy tavern? How droll. I always liked the signs that read, "Cool Inside," in great big letters with drifts of snow on top of them, too. Then below, in tiny letters, it said, "In The Winter." I used to hang around the classiest places, huh? Anyway, the geyser of excrement is under control because we've stopped using the bathroom for a day. Not really stopped, exactly. Throttled back. Tweaked the governor. Put a lid on it. No laundry and no Number Two, thank you. If you're reading this, (I know you're not) my wife would like to apologize to the McDonald's restaurant out on Route 2 for using their bathrooms like our own personal porta-pottie. We did buy an order of fries there, once, about five years ago, so I hope it's OK. I gave myself one day to figure out what was going on, steal some money, and get ready to fix the blasted problem once and for all. After our little experiment with the water, it was time to get serious. Concrete would have to be busted. There's no way of telling if the concrete floor in the basement below the basement was original equipment. It might have been a dirt floor originally. It looks like a quilt. 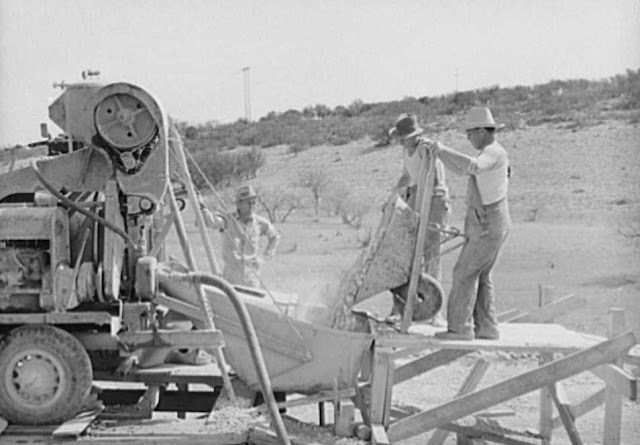 Concrete had to be mixed by hand back in the day, so they did it piecework fashion. They'd mix some up and place it by hand, or use a mixer a normal person would use to make a little mortar. The floors in my other basement still have the screed guides showing between the sections of concrete. If everything you know is learned from the Intertunnel, perhaps I should clue you in that a screed is not your trenchant political comments delivered in all caps on your Weebly blog. A screed is a tool -- a straight edge you drag back and forth in a sawtooth motion across wet concrete to push the aggregate (rocks) down into the mix, and to bring up the fines (sand) so that you can trowel it smooth. Civilians don't understand concrete very well. They call it "cement." Portland cement is an ingredient in concrete, but it's just powdery stuff. You have to mix it with water and crushed rocks and sand to get what you want. The proportions of the mix affect the type of concrete you end up with. The average person sees concrete being "poured" as a kind of porridge in the movies, after which it dries and is hard. But concrete doesn't "dry." Concrete becomes solid by a chemical reaction. It's exothermic -- it produces heat while it's curing. Concrete isn't "poured" really, either. Most concrete mixes are pretty stiff. The proper term for concrete work like slabs is "placing." Because so few people understand concrete, workers do whatever gets them sitting under the FREE BEER TOMORROW sign as early as possible. When the concrete mixer shows up, they tell the driver to put a bunch of water in the mix. This weakens the finished product quite a bit, but makes it run down the chute and fill up the forms all by itself. If you've ever filled up the forms for a full-height concrete wall with concrete that's not diluted to a fare-thee-well with water, you'd know how much shoving the stuff takes to get it to move anywhere. Concrete is so much stronger than it needs to be for residential construction that adulterating it with too much water doesn't matter much. Even if it did matter, there's no one around to make sure it's as strong as you're paying for. On jobs where it matters, like commercial buildings and so forth, the architect's office hires an engineer who hires a consultant who engages a subcontractor who has an underling who sends a toady to test the concrete as it's being placed. He takes a battered metal megaphone, fills it with chowder (the concrete), puts it on the ground with the bell side down, and then lifts the cone. He measures how tall the resulting pile is compared to the cone it came out of. This is named, aptly, the slump test. Too much water and the concrete slumps too much. It's a barbarous but effective way to keep track of concrete adulteration. It works. I'm a big fan of barbarous but effective methods for just about everything, now that I consider it. Slump tests are great because you can't lie to them. They're also great because if the concrete mix is unsuitable, you tell the driver to take it back to the yard. This produces a great deal of yelling which I've always enjoyed. Concrete truck drivers are a rough lot, especially in big cities where gangsters run everything. It was always fun to have them storm out of their cab, stand a quarter-inch from my nose, and threaten me with bodily harm if I didn't look the other way and let the concrete pass. I liked the quarter-inch distance, because no one could hear me say, very quietly, "Look, I know I'm not clinically obese and covered with yesterday's dirt like you are, and you think I'm the construction version of Mr. Rogers, but if you f*ck with me, I'll kill you." Then you smile. Worked every time. Anyway, the bad jobs, the gummint jobs, the fancy-pants jobs, they required more than slump tests. They'd take cylinders of the concrete and bring them back to their evil lab-or-a-tories, where they'd let them cure and then break them with sophisticated machines that measure the Moment of Inertia and the Point of No Return and other calculations that sound like Yes album covers. Can you see the flaw in this method? If the concrete fails the test, you have to go back and hammer it all out, even if it has a building on top of it now. That's why I like on-site slump tests. Nip it in the bud, I say. So my son is a regular person. He doesn't know concrete from couscous. He thinks concrete is this magic stuff that doesn't break. He knows his father is a bit daffy, and prone to taking on Herculean tasks without Hercules present. So he gave me a bit of a look when I said, "The concrete floor has to be broken up. Go out to the shed and get a sledgehammer." We do have some experience with the removal of concrete. There is some satisfaction in the destruction. And, the carting off part builds character in the kids. Funny how that quiet voice thing works. My husband has been known to put the terror into people on occasion, just by speaking calmly. I like the slump test; sounds like it should be a no-brainer. Kind of like tasting the soup before serving, or nibbling a little dough before you bake the cookies. Maybe that's why the brains don't like it so much. Get the lad a Kango hours of fun,rsi too! I've been enjoying your little updates so far, and learning a bit as well. Last summer I decided to fill in the gap our builders had left between the back door and the carport slab. Had never worked with concrete before so I did my measurements and calculations and figured 35 of the 80 pound bags would be needed. Took 3 trips in the SUV. Wife asked why not just one trip and I said that I'd like to keep the suspension in working order. Did the work over several near 100 degree days. As I am cheap, used a mixing tray and a hoe. Let me tell you, by bag #10 I was really really tempted to add a LOT more water than what the directions called for. I ended up with one bag left over and a pretty good result. Coulda been smoother on top, but I'm happy. You actually told The Heir thar be HARD WORK, physical labor, ahead? You baaaaaaaaaaaaaaaaaaaaaaaaaaaaaaaaaaaaaaaaaaaaaaaaaaaaaaaaaaaaaaaaaaaaaaaad. I hope you don't find the demo area to be the only quality existing construction in your castle. I hope you tap twice and shovel gravel. I am torn between wanting to get to the end of the story and really enjoying the cover band names that show up every day. I'd like to be pouring concrete sometime this summer, but I lost taste for the job the last time we tried it here. My wife insisted we could pour the cat's headstone offsite, and I said, no, we need a form and pour it in place. Eager to read what happens next. Sledgehammers always get my attention. Here is a link to what happens when you don't do slump tests. Hook it up with your garden hose, attach it to your sink faucet (there are fittings at the hardware store along with the sewer bladders), and put it in the sewer hole. In your case, the blockage appears to be between the house and where it connects to the sewer main in the street. Turn on the water. The bladder will expand to the circumference of the sewer pipe, thus forming a tight seal AND inccreasing the water pressure. Continue with this action until you are certain the blockage has reached the street. Once the blockage is removed, check to see in you need to repair/replace a cracked sewer (tree roots). I had a cracked sewer pipe and the plumber said don't worry about it yet -so don;t replace unless it is serious. As far as I know, it comes in two sizes (regualar sink drain size adn House Sewer size) and uses water pressure to force the water in the proper direction. On my uncle's farm there's a wall 18 inches deep by 150 ft built with failed slump tests. AT&T put in an underground something during the cold war a mile down the way. The farmer at the time put up forms and got any failed loads. This 150 page (more or less) book contains 37 quirky short stories, written by Gregory Sullivan, proprietor of the Sippican Cottage blog. The stories range from humorous, to ironic, to depressing, to startling - each one packs a literary wallop. Words are carefully chosen, clever phrases are woven in at just the right spots. 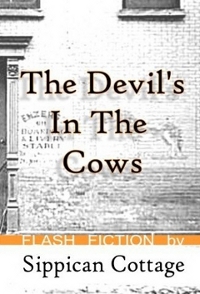 Each story stands on its own and is less than 1,000 words. I'm told that such short stories are now referred to as 'flash fiction'. Joe's a bit late getting this up, but he does link to you, Mr. Sippi. Thought you's like to know. You gonn’a add some calcium, it’s gott’a be still pretty frosty there? And what about the ground, it can’t be frozen or you’re asking for trouble. And you got a blanket? Or are you just gonn’a wing it and hope for the best since its “only” a basement.